This Chili has a very unexpected flavor. The sweetness of the Cranberries are such a pleasant surprise when coupled with the smokey heat of the Chipotle Peppers! Drizzle Olive Oil in the bottom of a pot on medium heat. Throw in a dash of Paprika. Chop the Tempeh into small pieces and add to the pot. Meanwhile, roughly chop the Chipotle Peppers. Let the Tempeh brown and add Braggs. Once the Braggs is absorbed, add 1 can of Black Beans, 1/2 Cup Vegetable Broth, and Chipotle Peppers. Cover with a lid. In a food processor, combine 1 Cup Vegetable Broth and 1 can Black Beans. Process until smooth and add the mixture to the pot. Roughly chop the Dried Cranberries and stir into the Chili. Stir frequently. After a couple of minutes the chili will start to bubble. At this point, reduce the heat to low and cover with the lid stirring occasionally. Finely Chop the Cilantro and juice the Lime. Combine with Sour Cream. 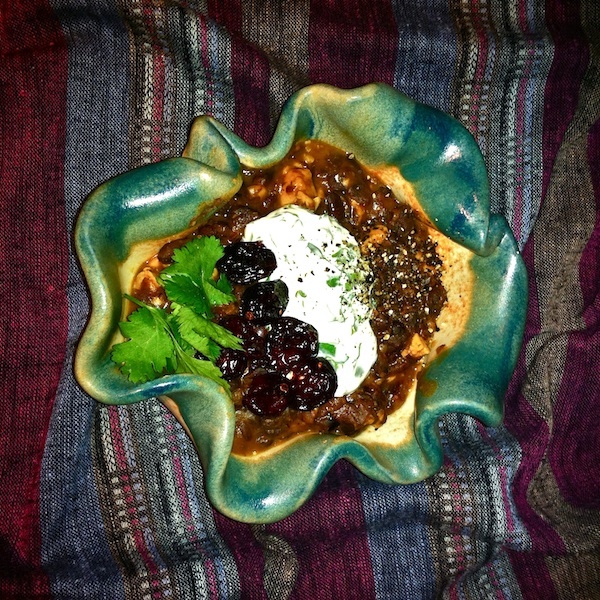 Serve Chili hot with a crack of Black Pepper and a dollop of Cilantro-Lime Sour Cream! This recipe can easily be vegan if a mashed avocado was substituted for sour cream!